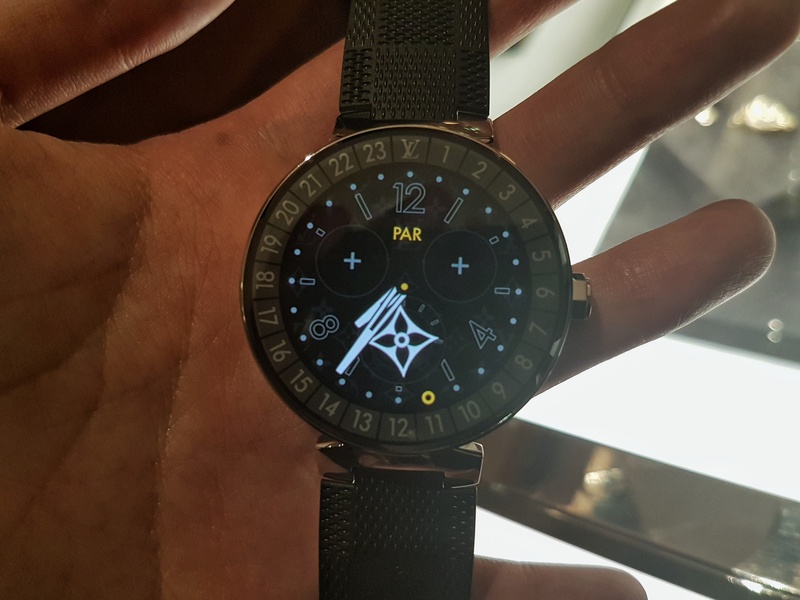 Some of you may recall a post from a few months back that covered a flurry of ‘smart watches’ released by traditional watch brands this year. If not, you can read it by clicking here. 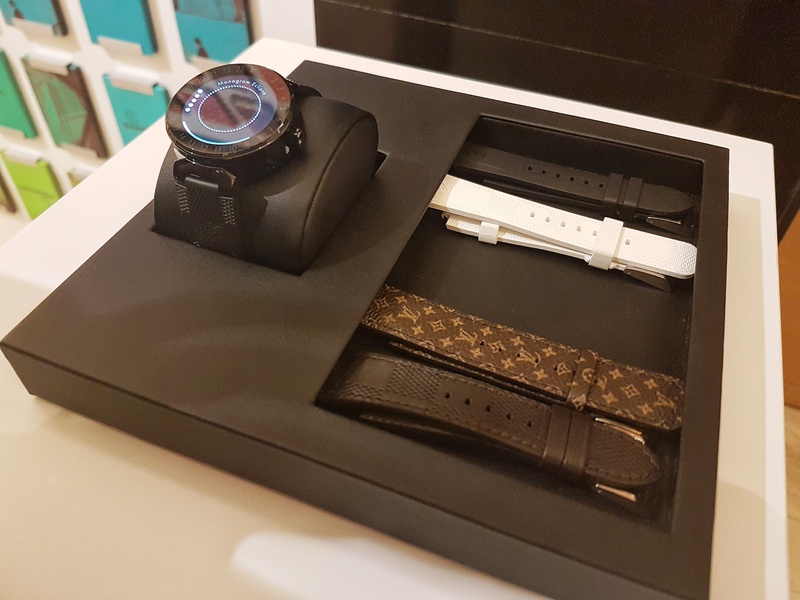 The latest to join this ‘wearable tech’ market is the house of Louis Vuitton, with the Tambour Horizon connected timepiece. 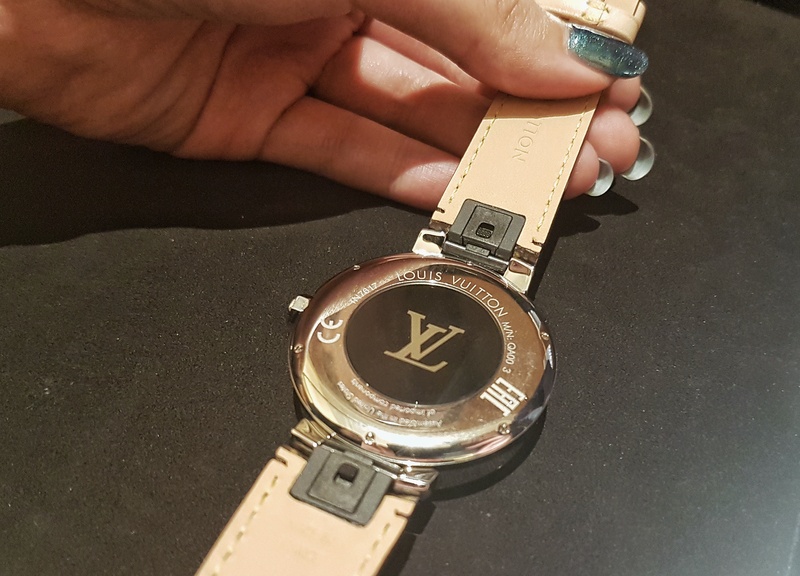 It being Vuitton, the externals are important, but as it’s a ‘connected’ watch, let’s first deal with the specs. 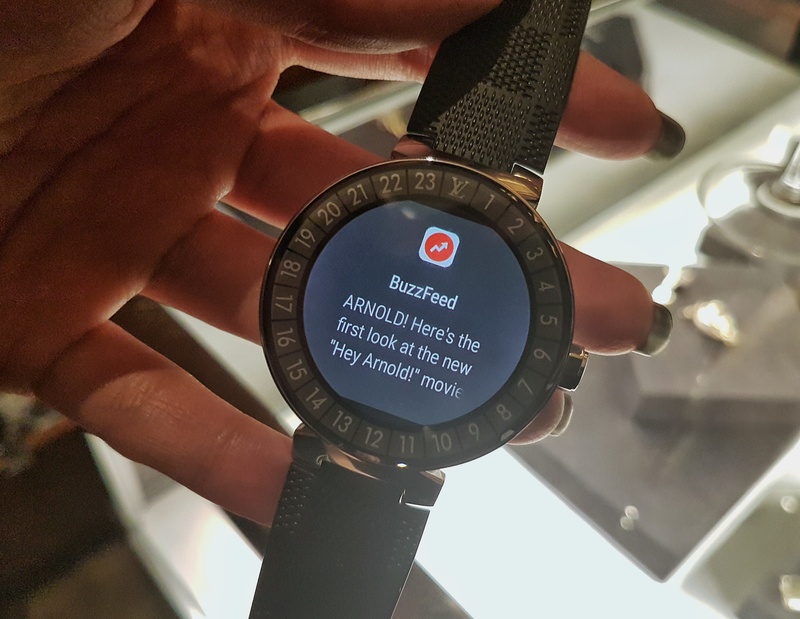 It has a 1.2-inch, 390 x 390 resolution AMOLED touchscreen display and runs on Android Wear 2.0. 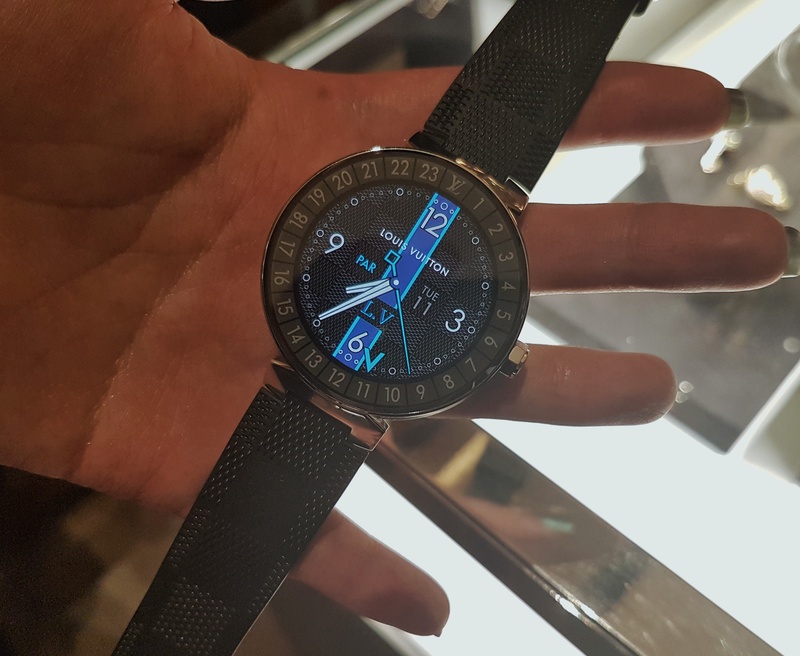 It uses the same Qualcomm Snapdragon 2100 processor behind the LG Watch Sport, has 512MB of RAM, and 4GB of storage. Connectivity wise there’s Bluetooth and wi-fi of course, and it is all powered by a 300mAh battery that I was told will last for about a day on ‘normal usage’ before requiring charging. Compatibility is with Android 4.3+*/iOS 9+ smart phones running Android 4.3* or higher, or iPhone 5 or later running iOS 9 or higher. Supported features may vary between platforms. As well as twenty-four time zones, weather, temperature and a step counter, there are a number of pre-loaded apps on the watch, as well as the many that you’ll be able to download for yourself. One feature that Louis Vuitton was highlighting at the Sydney launch event earlier this week was their City Guide, now in this micro mobile form. At present it covers seven major cities, but Sydney will hopefully be included soon, as will many other cities. In the same travel vein, there is also ‘My Flight’, an app that tracks you flight and alerts you to boarding changes such as delays and gate changes. 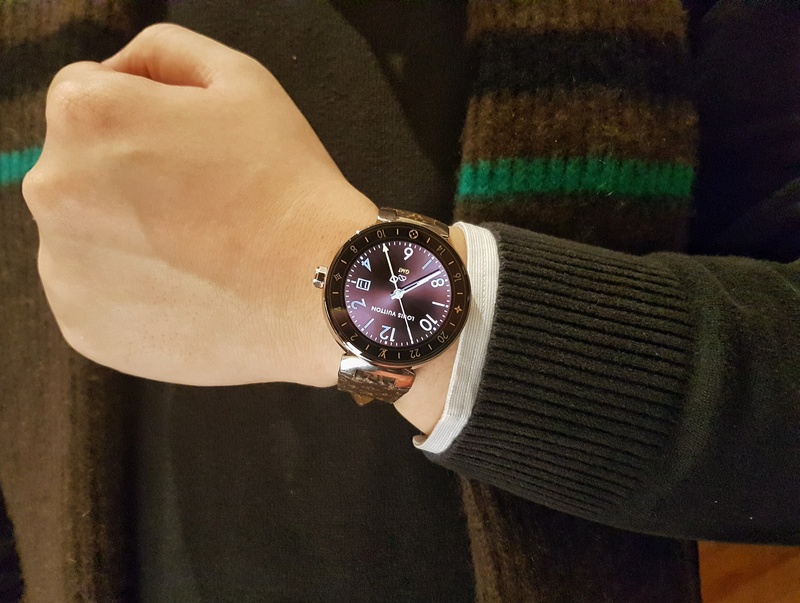 Naturally, it’s all about customisation when it comes to watch faces, and in this Vuitton fans will find familiarity. The 42mm Tambour Horizon smartwatch comes in three models; Black (stainless steel with PVD), Graphite and Monogram. All feature stainless steel watch cases and buckles with sapphire glass on the back. Along with this, there are sixty strap options; straps are put on and taken off using their proprietary strap slick system. If you want to get a feel for how it all starts, with this new watch, click on this link for a tutorial explaining how to connect it to the LV Pass and access content. You’ll also find more details about functionality and strap options at this link.